John Elder, professor emeritus of English and Environmental Studies at Middlebury College, gave a lecture at the Monterey Institute entitled “Field Stories: Learning Beyond the Campus” on Tuesday, April 2, 2013. In this lecture John reported on his recent experiences of pursuing the goals of liberal education through work off campus and outside the traditional classroom structure. John introduced the concept of “ecotonal education,” a concept that maps ecology and systems thinking on education and perhaps offers us a means to re-frame interdisciplinary teaching and learning. An ecotone is defined as the space between habitats or fields; at the edges or boundaries of natural habitats these spaces tend to be rich in bio-diversity where new species develop, and adversity and opportunity abound. John offered the ecotone as a new metaphor for thinking about the relations between academic disciplines, between the university campus and the ‘real world,’ between online and face-to-face teaching and learning, and between cultures. He offered examples of immersive classes dedicated to sustainable rural communities and online discussions of poetry. John Elder taught English and Environmental Studies at Middlebury College and the Bread Loaf School of English for 37 years. 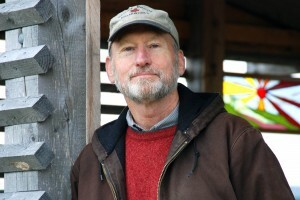 He edited the Norton Book of Nature Writing with Robert Finch, and his most recent three books, Reading the Mountains of Home, The Frog Run, and Pilgrimage to Vallombrosa, all combine discussion of environmental literature, description of the Vermont landscape, and memoir. In addition to stories of Frost, Bashō, ballads, and pastorals, comparative studies of the literature and landscape of Japan, Italy, and Ireland have complemented his work in northern New England. Read more about him here.